Jan Lenica was a leading figure in the Polish School of Poster Art, a term he coined in 1960 in the Swiss magazine Graphis. This poster depicts a scene from of Alban Berg’s atonal opera Wozzeck. The opera’s title character stabs the mother of his child in a fit of jealousy and then throws the bloodied weapon into a lake. Transfixed by the moon, Wozzeck decides to retrieve the knife and cast it deeper into the water. As he wades into the lake, the water appears to turn to blood. Overtaken by the water, Wozzeck drowns. His moans—which seem to come from within the lake itself—are loud enough to startle passersby. Lenica’s alarming composition unites the form of the drowning Wozzeck with the rippling currents of the bloodied water and the full, blood-red moon above. 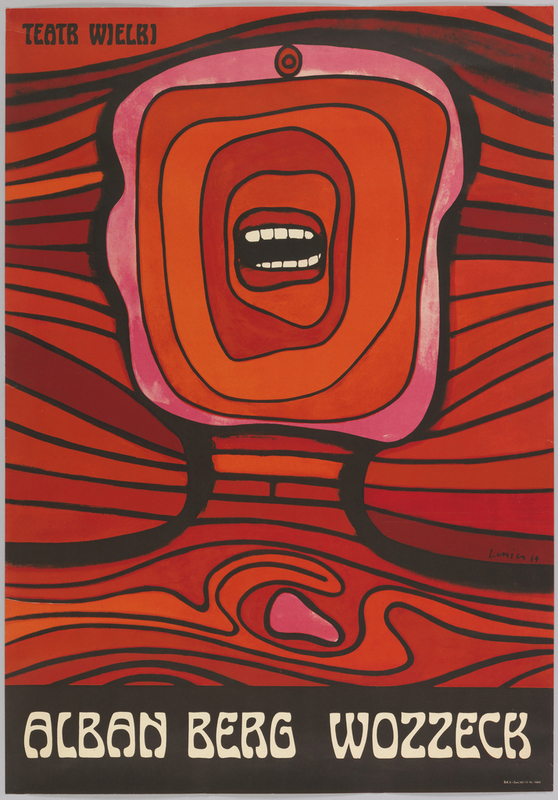 Poster, Wozzeck; Jan Lenica (Polish, 1928 - 2001); 1964; Offset lithograph on paper; Museum purchase from Friends of Drawings & Prints Fund, 2013-30-1.